These water toys are great for the bath or other water play. They are soft enough to chew and firm enough they are safe. Did you know that chewing is not just about relieving discomfort? Babies and toddlers are hugely sensory and the act of chewing is soothing and calming. The sensory feedback stimulates their brain development through touch, with their textured surfaces and shapes, and the chewing motion can be helpful to jaw and cranial alignment. 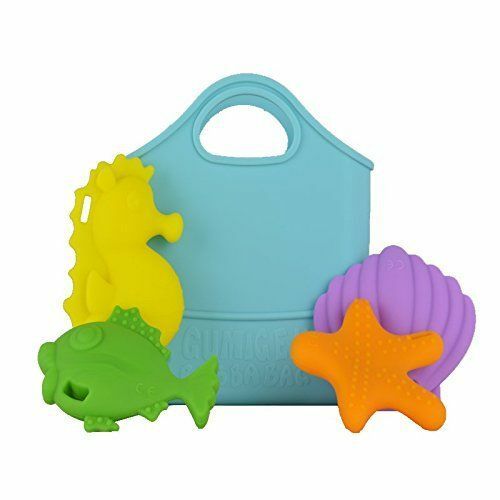 The fun shares inside the bag are weighty, making them more fun for sinking and finding and playing under the water, giving babies and toddlers experience of both he object and the water. The bag is made from flexible chewable material and has holes in the bottom so it can be used as a little shower. All round this is a lot of fun for water play, especially at bath time.